The study of patron-client politics is new to the study of Hong Kong political science. 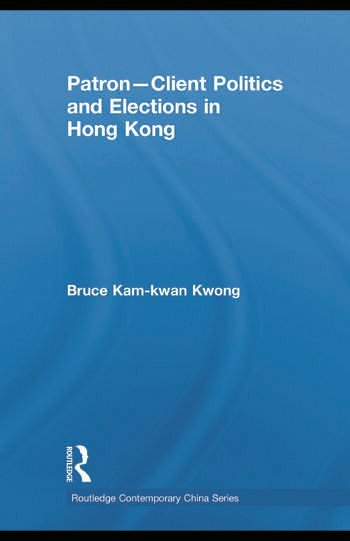 This book examines whether patron-client relations are critical to the electoral victory of candidates; how the political elites cultivate support from clients in order to obtain more votes during local elections; and tests the extent to which whether patron-client relations are crucial in order for candidates to obtain more ballots during elections. Covering patron-client politics and public administration in Hong Kong; the electoral dynamics including the Chief Executive elections and the Legislative Council elections; the cooptation of key elites by using patron-client mechanism; the study of the committees and elites who have been politically co-opted; the appointment mechanisms that have played a crucial role in patron-clientelism; and finally the China factor in the entire processes and politics of patron-client politics. Bruce Kwong finds that the better candidates cultivate patron-client relations, the greater their chance of winning the election; and the smaller the size of the electoral constituency, the greater the impact of patron-client relations. Finally, the book stresses the role of Beijing as a powerful patron shaping the Hong Kong Chief Executive and the latter’s clients and analyzes the political implications and long-term consequences of patron-client politics in Hong Kong. Bruce Kam-kwan Kwong is Assistant Professor at the Department of Government and Public Administration of the University of Macau. He earned his doctoral degree at the Department of Politics and Public Administration, the University of Hong Kong. His research interests include patron-client politics, civil service reform, policing, and elections in Hong Kong and Macau.